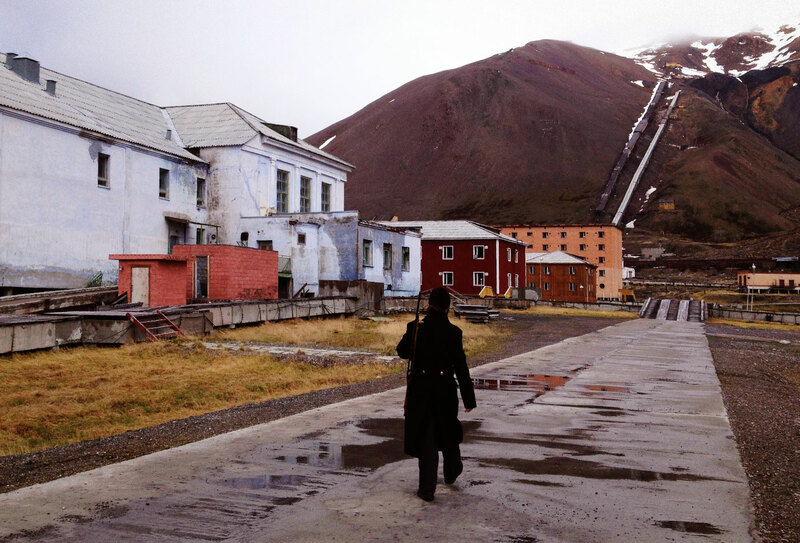 The rise and fall of Pyramiden, a Russian mining town located in the Arctic archipelago of Svalbard. We docked just past midnight, the sun to the south shining through a thin layer of clouds. It was late June, and the sun hadn’t set for months in the Arctic archipelago of Svalbard; it wouldn’t set again until the end of September. For the previous two weeks I’d been on board a ship sailing the perimeter of the arctic archipelago of Svalbard, as part of the artist residency The Arctic Circle, and we’d reached one of our final stops. The dock we tied the boat to was a decayed mass of wood, warped and chewed to the appearance of shredded wheat. To our left, a massive structure for loading coal onto ships. To the right, blocks of buildings without form or purpose or inhabitants. 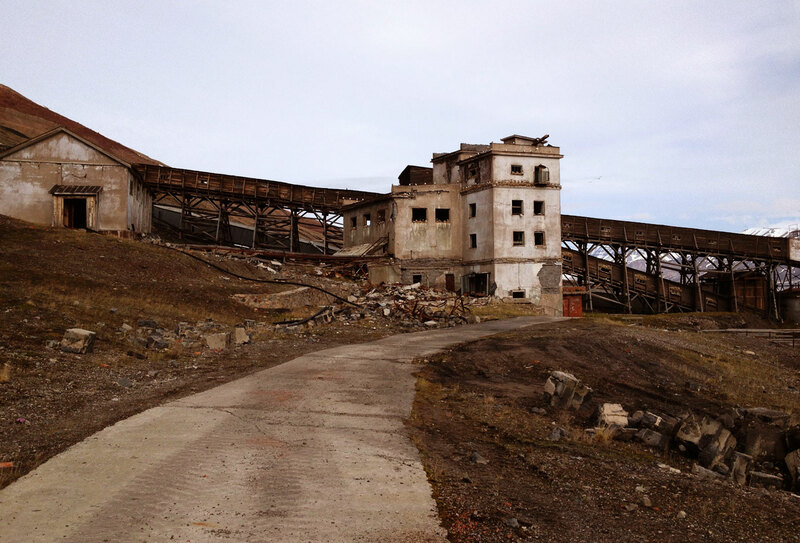 This was Pyramiden, a Soviet-era mining town that’s been abandoned for over 15 years. The Spitsbergen Treaty of 1920 gave Norway sovereign rights over the archipelago, but all signatories—the U.S., U.K., Japan, Russia among them—were given equal mining rights and access to any of the land’s resources. Only the Soviet Union would ever take advantage of this, and in the years after World War II, it established two coal mines on Spitsbergen: one at Pyramiden, and one at Barentsburg. Barentsburg is everything you’d imagine a Soviet mining town to resemble: bleak and functional, industrial and hopeless. But at Pyramiden, a thriving community was built over the years, and the town evolved into something of a utopian space. Among its amenities were a cultural center with a theater, a library, art and music studios; a sports complex; and a cantina open 24 hours a day. Pyramiden is home to the northernmost statue of Lenin, the northernmost grand piano, and the northernmost swimming pool. It was, in its heyday, unlike anywhere else on the planet. The vaguely pyramidal mountain after which the town is named disappeared up into the fog, hovering over everything just out of sight. Along one side ran two long tunnels reaching nearly to its apex—one for hauling up men, the other for hauling down coal. Perhaps most eerie on that first night were the lights burning in the distance—area arc lights shining orange in the stillness. What was the point of these lights, illuminating a night that has no darkness, for a town that has no inhabitants? Abandoned items at the basketball court. Pyramiden was abandoned in 1998. The town’s population, then somewhere around 300 people, was given four months to leave, and they left behind everything non-essential. Walking through those buildings, it felt as if some vague poisonous gas had swept through and killed everyone in a matter of minutes. There were signs of life everywhere—trays still on tables, rolls of film in the projection booth, musical instruments strewn about—alongside the inescapable fact of decay and abandonment. In the gymnasiums lay sports equipment that would never again be used, books that would never again be read. The world’s northernmost swimming pool is now empty; the world’s northernmost grand piano now badly out of tune. The triumphant gaze of Soviet monuments now look out over nothing but emptiness. 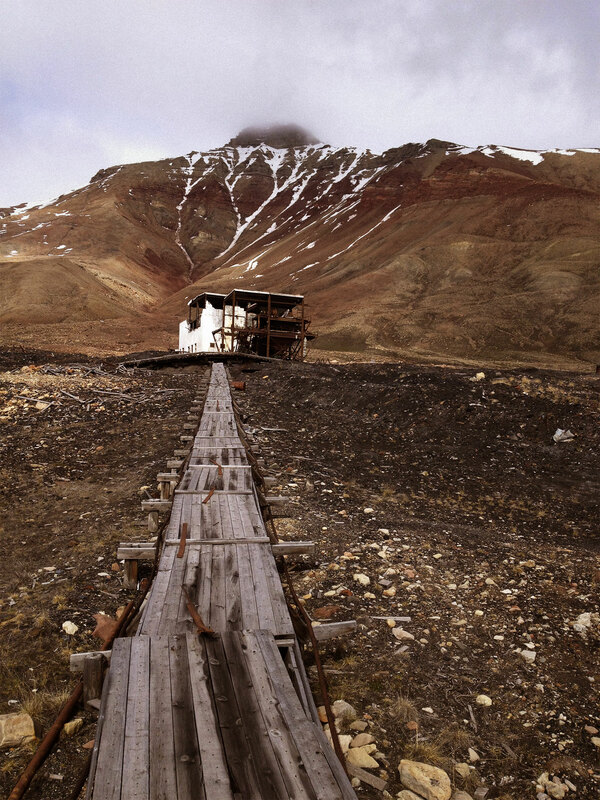 Pyramiden is not the only ruin on Svalbard; the archipelago is a museum of folly and failure. Humans have tried to extract resources and riches out of the barren frozen land up here, to very little success. On the west coast of Spitsbergen, near the research settlement of Ny-Ålesund, is the abandoned marble mine of New London. Built by Ernest Mansfield in 1911, who convinced the Northern Expedition Company to invest in a lavish operation. There is indeed marble, but it’s of such brittle and poor quality due to permafrost that it literally fell apart on the ships bound for England. After two years the NEC fired Mansfield and abandoned the settlement. A hundred years on, the ruins of New London are remarkably well preserved. The ore carts are overturned and rusted, but still intact, resting next to heaps of marble piled up along the cliffs, as if the next ship bound for England will be arriving shortly. The piles of marble—deliberate, definitive remnants of human work—refuse to be reintegrated into the landscape. The Arctic allows New London to linger as a ruin, a testament to how difficult it is to make a quick buck in a place as inhospitable as Svalbard. Sasha, our Pyramiden guide, met us as we approached. He strode down an empty road in a full-length black coat, rifle slung over his shoulder. Materializing as if out of an Eisenstein film, he welcomed us with a strange charm and led us through the town. “On the right is the male campus, for single men, and that was called ‘London,’” he told us as we walked towards the cantina. “Over there is the campus for single women, and that was called ‘Paris.’ When you got married and had children, you moved into that building over there. They called it ‘Crazy House.’ They called it this because there were so many children—and especially in winter when the children could not play outside, so they played in the hallways, and it was the Crazy House.” He unlocked the cantina, the swimming hall, and the cultural center, and then went to the boat to negotiate a trade of fish from our boat in exchange for meat or maybe vodka. The Crazy House is now overrun with gulls, who’ve made their nests in the window sills. A slab rectangle of a building, four stories of brick, straight from Cabrini-Green or Pruitt-Igoe, now given over to gulls in every window. Bird cliffs on Svalbard are usually high up the faces of its many jagged peaks (“Spitsbergen” is Dutch for “pointy mountains”); this one was instead repurposed from humanity’s detritus. The entire day they swirled about, with a ghastly, plaintive call, rising and echoing against the stillness. The Crazy House once more. The main route between the dock and the town is named “The Street for the 60 Year Jubilee of the Great October”; it’s the central axis around which all the buildings were oriented, both symbolically and literally. This rigorous spatial order in Pyramiden has caused difficulties over the years: as the town expanded north into an active riverbed, a series of dikes and dams had to be established to change the course of the river. Meltwater in Svalbard is unpredictable, as the accumulating snow varies from year to year, and minor fluctuations in summer temperatures can cause unexpected floods. But rather than build Pyramiden to respond to these natural ebbs and flows of the nearby glaciers, Soviet engineers instead altered the flow of the waters in a complicated and expensive engineering project. Additionally, the annual thawing of the permafrost below the town caused issues, creating unstable and temporary mudflows. In order to protect important buildings from sinking into the precarious wet ground in the spring and summer, Pyramiden’s designers installed a series of subterranean Freon-systems around large buildings to keep the ground permanently frozen. The goal of the layout, then, was to emulate the same kind of rigid ideology and order of any Soviet town, to separate out Pyramiden from its actual landscape, to differentiate it from the terrain and glorify an idea over a reality. Thus the paradox of Pyramiden: a place unlike any other, meant to look exactly like any other place. The failed marble mine at New London was just one of many such ventures at the dawn of the 20th century, when various countries attempted to mine the land for various minerals: coal, gold, oil. Conflicts over claims in what was essentially a lawless and stateless land led to a treaty—the Spitsbergen Treaty (later known as the Svalbard Treaty), signed in 1920, was meant to put an end to this by giving the somewhat neutral Norway control over the archipelago. The liminal state of Svalbard’s sovereignty has led to odd complications during the Cold War. NATO-member Norway and the USSR kept up a polite pretense of sharing the islands and paid lip service to the treaty’s stipulation that the archipelago never be used for military purposes. But behind the scenes, of course, both nations made subtle appropriations of Svalbard. The Soviet Union long maintained a robust helicopter fleet in Barentsburg, far in excess of what two small mining towns would ever need, and stationed its nuclear submarine fleet at the nearby Kola Peninsula. Norway, for its part, sends a naval cruise to the islands once a year to remind others of its sovereignty—even while the two nations kept up pretenses, hosting winter sports events and other niceties. The base of the mine shaft. Among the many subtle fronts on which this war was waged was nomenclature: Only a few years later after the Spitsbergen Treaty was signed, Norway renamed the entire archipelago Svalbard, keeping the name Spitsbergen only for its largest island. The name Svalbard came from an Icelandic epic from 1194, which described how Norse sailors had supposedly reached a land they called Svalbardi, “the Cold Rim,” and which the Norwegian government claimed was proof that theirs was the original claim to the islands. It was of course, impossible to say what those Norse sailors, had they truly existed, had actually reached in the 12th century, but Spitsbergen became Svalbard, a subtle but important linguistic effacement of any other nation’s claim to this land. Though Norway has attempted to blur the linguistic history of the islands, it still works to protect the various detritus that speaks to failed human intervention through the years. By law, you are not allowed to disturb anything on Svalbard labeled “cultural heritage”: the ruins of the past, be they whale bones, abandoned shacks, even down to loose boards on the beach. Nothing can be taken or molested. 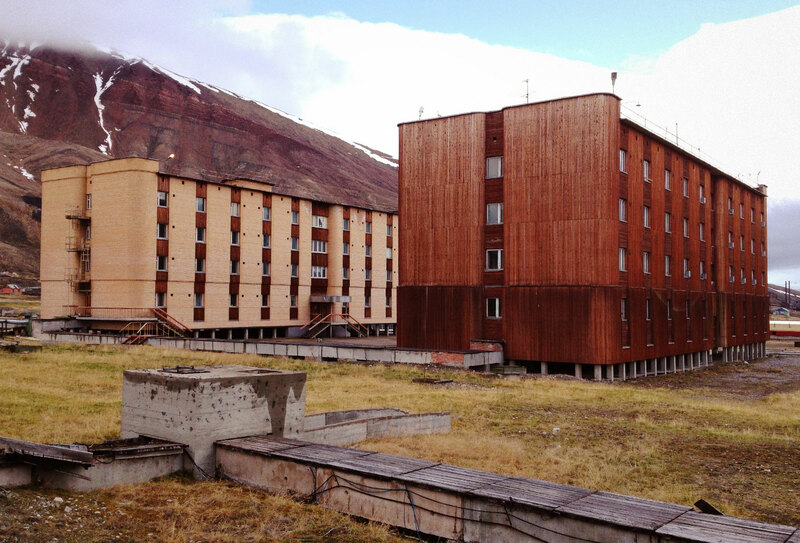 Pyramiden’s campuses for single men and women: “London” on the left, and “Paris” on the right. Sasha returned and found us in the plaza just outside the Crazy House—a space I later learned was the town’s cat graveyard—and under the wail of gulls he told us his story and the story of this place. 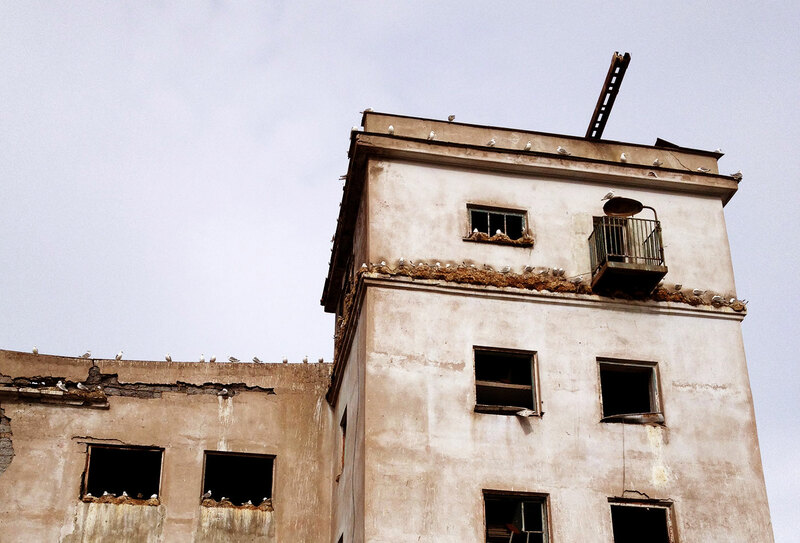 Once a graduate student in geography, he now stayed in the hotel, on the otherwise-abandoned second floor. He loved it—in St. Petersburg he slept on the kitchen floor of his sister’s apartment, and this was the first time, he said, that he had a room to himself. When they built Pyramiden, the Soviets imported two tankers full of sand, and in that sand were grass seeds that have since taken root and flourished. The day we landed at Pyramiden was beautiful—full of sunshine and temperate after two days of bleak rain and wind—and the warmth combined with the grass—something that doesn’t exist outside of the Svalbard settlements, something other than the hard-scrabble lichen that claws itself alive on the archipelago’s rocks—made it feel as though we were suddenly in far lower latitudes, even though we were still north of the island’s main settlement, Longyearbyen. 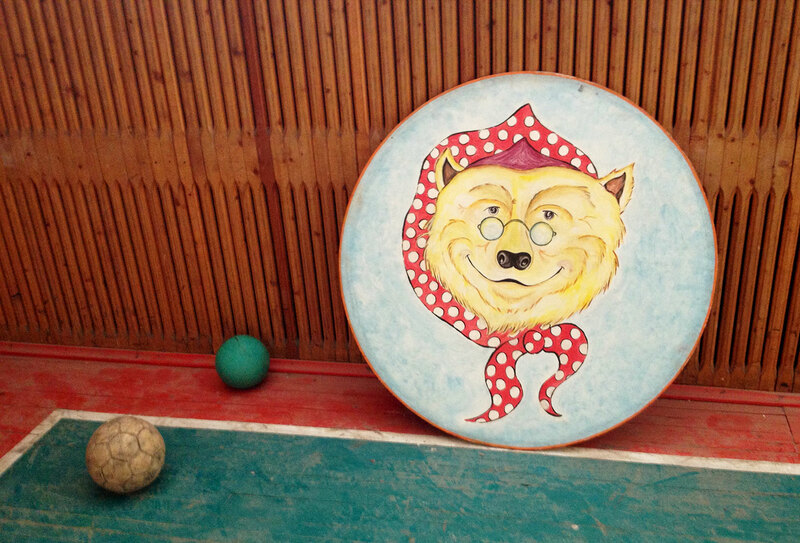 When asked about Pyramiden’s abandonment, Sasha gave us four different stories. The Soviet Union, he said, was rich, and could afford a big investment like this. But Russia was quite poor by comparison, and couldn’t afford to maintain it. Second, there was a fire in the mine in the mid-’90s, and it was all but impossible to pump water 500 meters up the side of a hill to put it out. Third, he told us, supposedly the geologic survey was wrong, and there simply wasn’t as much coal in Pyramiden as they’d thought. Lastly, in 1996 a chartered plane of miners and their families had been returning to Longyearbyen from a vacation when it crashed, killing all 141 aboard. That was 1996; the town never fully recovered, and was emptied two years later. 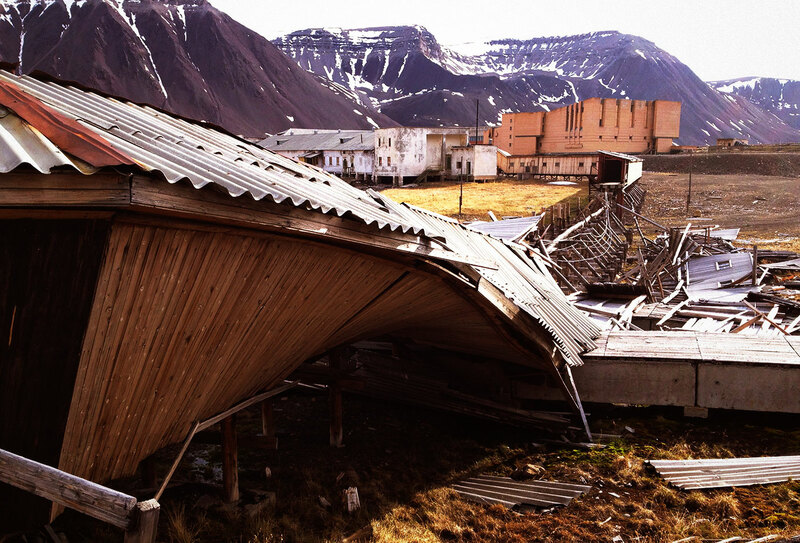 Someone later asked what had happened to the families of Pyramiden—where did they end up? Many went home to Russia, Sasha said, but some now live and work in Barentsburg. Over the years, he said, a few have come back to Pyramiden for a visit, though this is strongly discouraged. When asked why, Sasha said that it’s too painful for former residents to see what has become of their utopia. On two separate occasions, he told us, former residents had returned for a visit, and had become so distraught that both had suffered heart attacks. The coal mine and the mountain. After lunch we took a small party up near the base of the mine. As Andreassen, Bjerck and Olsen explain, regarding the layout of Pyramiden and its enforced geometry on top of a constantly evolving floodplain, “the bottom line was that Pyramiden developed in a way that demanded constant management and intervention to protect it from the harsh Arctic conditions.” In the 15 short years since it has been abandoned, the ever-shifting meltwater has taken its revenge, wiping out wide swaths of the town. We navigated along uncertain paths as we made our way up towards an almost medieval-looking white building three stories tall that stood next to the two long tunnels that stretched up the mountain. Whatever I had thought of the birds near the Crazy House was dwarfed by this strange landscape—they were everywhere. The gulls had completely overtaken this place: they were in every eave and every window, along the rafters of the tunnels. They were oblivious to our presence no matter how close we came, engaged entirely in their own society. Sasha came back to our boat to join us for dinner, bringing with him a strange wealth of stories, like how he’d found Pyramiden’s KGB office, behind a steel door, and in there a special stove dedicated to burning secret documents. He hadn’t stayed long, terrified that it was still bugged or rigged with traps, but he did take with him a pad of paper on which each page was stamped “SECRET,” which he now used for letters to his friends; how during World War II the entire town was destroyed so that the Germans couldn’t use it; how men are still dying in the mines of Barentsburg, including one miner who’d died in an accident just a week before. Later he told us that all the mines on Svalbard are unprofitable, even the Norwegian ones—something I’d already begun to suspect. At Barentsburg, the last operating Russian mine, most of the coal extracted is used to power the plant that serves the town itself. What’s left is of too low quality to be used for fuel and is sold to chemistry labs. When asked why they continue, he replied, “It’s important for Russia to stay. If we leave Barentsburg, we could never come back.” Already, he said, he gets letters every week from Norwegians seeking to buy Pyramiden—or just the hotel, or even just a floor of the hotel. The Norwegians, he claimed, are desperate to claim some wedge of the deserted city, because they know that if they did they could erase any trace of Russian habitation within a few years. And Pyramiden itself, I asked—was it ever profitable? I thought about the massive investment that the city represented. “No,” Sasha said, “never.” Then he said, “I don’t like to use this word, but Pyramiden was a ‘showcase.’” What mattered to the Soviet Union was that it was there, that it represented to the world an ideal Communist society. And then the Wall fell, and they couldn’t maintain the fiction anymore. In the wake of the Cold War, the territorial dance between nations in the Arctic has shifted somewhat; often now the disputes are over fishing and shipping rights, as well as seemingly anodyne tourism issues. But beneath this there are still machinations at work. As the Arctic continues to yield its waters to global warming, nations from Canada to China are eager to lay claim to it. And there is little doubt that both Russia and NATO still see Svalbard as a strategic asset. But all this may miss the larger lesson Svalbard has to offer: beyond the short-term future of nations jockeying for political and military power in the thawing North, Pyramiden reveals how quickly the world will move on without us. Birds roosting near the mine shaft. The image of those mining buildings and tunnels overrun by gulls stayed with me for weeks. I don’t know that I’ve ever been in such a place before—a place built by humanity that had been so thoroughly reclaimed by nature as to neither admit nor acknowledge a human presence, where a mine built against the grain of the land itself, to celebrate an ideology, now had all the meaning and purpose of granite cliffs forged by retreating glaciers. If it once made sense to think of Pyramiden as separate from the natural world around it, now the two were one and the same. And all this accomplished in 15 short years. One gets a sense in Pyramiden of what the world will look like without us, a world in which humans may exist and persevere, but in which human activity is no longer differentiated from nature, where human history has once again joined the deep geologic time of the earth itself. Underneath those gulls screeching and wheeling above our heads, unconcerned with our presence, I thought of the words of the German W. G. Sebald, whose work spiraled around the calamities and horrors of the 20th century—most notably the Holocaust, but also the Allied fire-bombings of cities like Dresden and Hamburg. Writing of those horrors, Sebald asks how can notions of philosophy, ethics, and humanism be maintained in the face of such destruction. What I learned in Pyramiden is that one needn’t look to these massive catastrophes for such proof—sometimes all it takes is a plane crash, a fire, and a few irrevocable bureaucratic decisions. Colin Dickey is the author of Cranioklepty: Grave Robbing and the Search for Genius, and Afterlives of the Saints: Stories from the Ends of Faith. His work has appeared in Lapham’s Quarterly, The Believer, The Paris Review Daily, and elsewhere. He is currently working on a book about haunted houses. Edited by Mike Dang. Fact-checked by Kaci Borowski. Photos by Colin Dickey.